Porcelain crowns are versatile and can be used in cosmetic and restorative dentistry to improve the health and appearance of the smile. Dental crowns offer functional, natural-looking results. Dr. Jean E. Barthman offers porcelain crowns at our Redwood City, CA dental practice. Here, our team explores porcelain crowns aftercare, and explains how patients can maintain their new smile for many years to come. Unlike natural tooth enamel, porcelain is impervious to decay. However, this does not mean that restored teeth are invulnerable to problems. In fact, teeth that have been restored with crowns need to be cleaned just as much as natural teeth. Why? Because the natural tooth structure underneath the restoration can still decay. In fact, if dental care is continuously ignored, recurrent decay is highly likely. Therefore, it is essential that patients attend all routine dental appointments and follow an at-home hygiene regimen. All patients should brush at least twice a day and floss once a day. This will keep cavity-causing bacteria at bay and protect your smile between dental visits. When flossing, be sure to slide the floss out of the gaps when complete, rather than lift it out. Repeatedly “snapping” the floss out from between the teeth could loosen the restoration over time. We also recommend using an antibacterial mouthwash, which can reduce microbe levels and leave your mouth feeling fresh and clean. 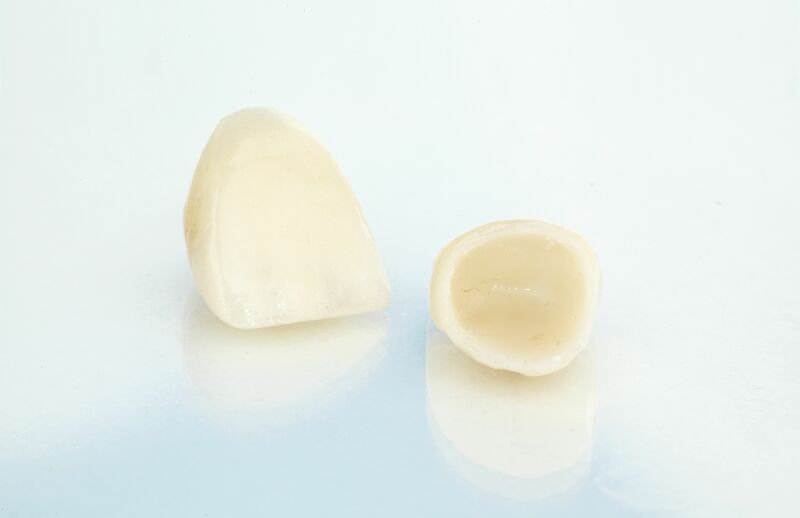 Porcelain crowns are made to last and can withstand the normal forces of chewing and eating. However, like natural teeth, they can also chip, crack, or fracture when exposed to excessive or irregular pressure. Individuals who suffer from bruxism should wear a night guard to protect their teeth from damage. For those with dental crowns, this is even more important, as clenching or grinding the teeth can result in damage to the restoration. While “boil-and-bite” mouth guards can be somewhat effective, a custom oral appliance is typically recommended for maximum protection and comfort. In addition, those who play contact sports of any kind should wear a mouth guard during practices and games, whether they have dental restorations or not. The majority of sports-related injuries are dental in nature. Investing in a custom athletic mouth guard can save you a tremendous amount of money in restorative treatments, which would be inevitable should damage occur. If you are considering a porcelain crown, or if you have already undergone the procedure, understanding proper aftercare can help you maintain your new smile and enjoy long-lasting oral health. As always, our team is here to answer any questions you may have regarding treatment. To learn more, contact us online or call our office at (650) 367-4967.